For the last six months, we’ve been engaged in a design competition called Passageways 2.0 as part of a team composed of local artists and designers from multiple disciplines. Our team, Graffix Alley, was thrilled to be chosen as one of three semi finalists, along with two very talented teams from Syracuse, N.Y., and Boston, Mass. The winner will be announced this Friday. Of course we hope to be chosen to put our design in place, but even if we aren’t, we’ve had a great time working with such a diverse group of artists and professionals. In 2016, Chattanooga hosted the American Institute of Architects (AIA) Tennessee State Convention and, as host, the leadership team decided to make the convention more open and engaging to a broader public. This afforded the AIA Tennessee the opportunity to step out of its comfort zone and open up dialogues about Architecture and Design’s roll in the public realm, moving the conversation beyond an insular one between client and Architect. As part of that initiative, Passageways 1.0 was born. 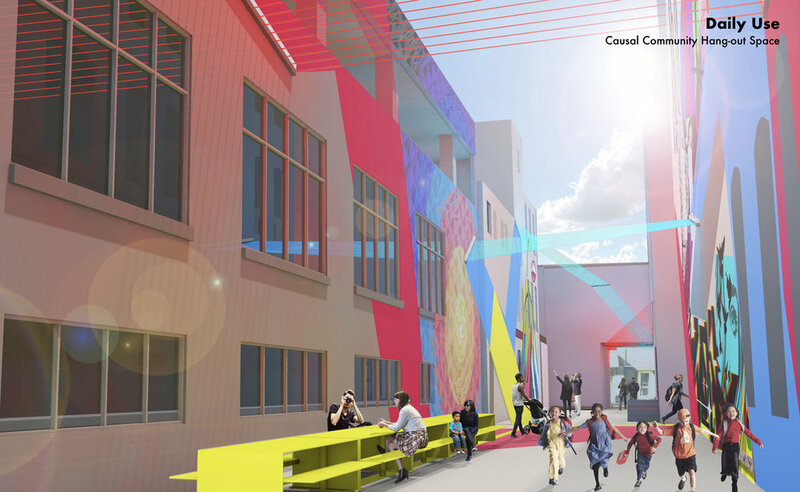 An open design competition hosted in conjunction with River City Company, the competition asked architects, artists and designers to envision ways to activate several underutilized alleys in Chattanooga. The inaugural Passageways Competition drew widespread interest; designers from around the globe submitted entries, and national and international design publications reported on the event, generating press coverage for the State Convention. But more important is the impact that the competition and resulting installations had on the local culture. Passageways 1.0 proved a couple of points. First, that there was a desire for public spaces activated through art and architecture in Chattanooga’s downtown. And second, that the people of Chattanooga were willing to show up and put in the work to see projects like this be realized. Passageways 1.0 showed us that we can can flip how we think of underused public spaces. We can experience them as places of unexpected enjoyment and fun, rather than as places to be ignored or avoided. Passageways 1.0 was conceived as four temporary installations in four downtown alleys, some of which have long outlasted their projected year-long life span, and one of which has been made permanent. We know a lot of talented and creative people, and we wanted to take advantage of the opportunity to all play together in the same sandbox. Graffix Collective is composed of: Workshop: Architecture, Range Projects, Juncture, and The Artist Seven: four unique Chattanooga companies working in their own ways to use the art and craft of design to make better places. The idea of a communal gathering place; how to provide a space within the city that addresses the democratic nature of a city. Recognizing the history of this particular alley as a significant place for street art and graffiti in Chattanooga. We wanted to work collaboratively as a team to bring a unique vision to the alley; one that is authored through an honest reading and understanding of the significance of this particular alley AND similar spaces that exist throughout all urban environments. This very alley is fondly remembered by many in Chattanooga as Graffiti Alley, a place to discover and see an art form that was uncommon to Chattanooga. Over the years, as other parts of downtown have experienced a resurgence, this alley has deteriorated. Our plan seeks to revert back to that place of art and discovery through a curated process of bringing local and nationally established muralists to install high-quality street art in this alley. We want to take this alley from a state of neglect and make it a destination for art and community by celebrating and honoring street art within its native habitat. 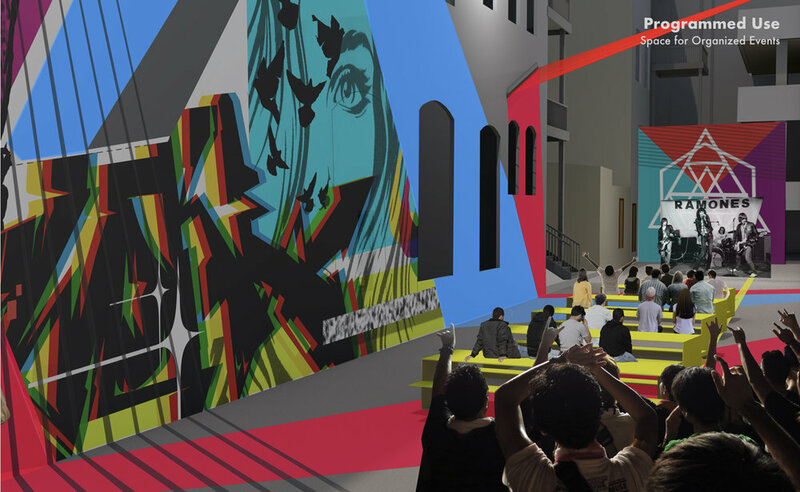 Our design for GraffiX Alley is an architectural intervention that serves to delineate space and set up a series of frames for large scale street art murals. Within the this large open-air gallery space, we set up a community table that serves the two-fold function of spontaneous community gathering place and organizable space for programmed events. After the architecture and infrastructure is installed, five muralists will install their pieces in the alley in an event that will allow the public to meet the artists and watch them work. The consistent message that we hope to send with GraffiX Alley is that art and the city are open and available to everyone, and that when we build places that allow everyone to participate in the city, our city will prosper.